Cape Town, 13 September 2018 – With Africa’s only IAAF Gold Label-status marathon less than two weeks away, Capetonians have added reason to celebrate the start of spring. This year’s iconic African city marathon, which weaves its way along the Atlantic Seaboard, and through the CBD and Southern Suburbs, before looping back into town, will play host to over 10 000 marathoners. It will feature runners from as far afield as Australia, with South Africa’s Stephen Mokoka, Desmond Mokgobu and Nolene Conrad also competing for this year’s title in an elite athlete field. Nineteen spectator zones have been carefully set up along the route, some of which will be co-hosted by local charities. These offer prime visibility of all the colourful action on the route, and enable supporters to also enjoy live musical entertainment, food and drinks, as well as a chance to meet local celebrities. The zones can be found at Sea Point Swimming Pool (4km mark); City Hall and the Grand Parade (13.8km); Victoria Road, Woodstock (16.5km); Observatory Main Road (18.7km); Rondebosch Main Road (20.8km); Newlands Main Road (21.1km); Newlands swimming pool arena (22.4km); opposite Newlands Cricket Grounds (23.4km); Campground Road/Sandown Road (25.7km); Rondebosch Common Park Road (28.5km); Rondebosch Common opposite Red Cross Children’s Hospital (29.7km); Rondebosch Common near Rustenburg Girls’ High (30.8km); Liesbeek Parkway at Durban Road (32.6km); Liesbeek Parkway opposite Hartleyvale (33.7km); Salt River Circle and the Biscuit Mill (36km); Strand Street at Good Hope Centre (38.7km); Bree Street near the Prestwich Museum area (40km); Somerset Road Green Point Fanwalk (41km); and Vlei Road, Green Point (finish). Spectators can expect to see a sausage-dog suit worn by five runners linked together, running for The Cape of Good Hope SPCA and aiming to set a new Guinness World Record. 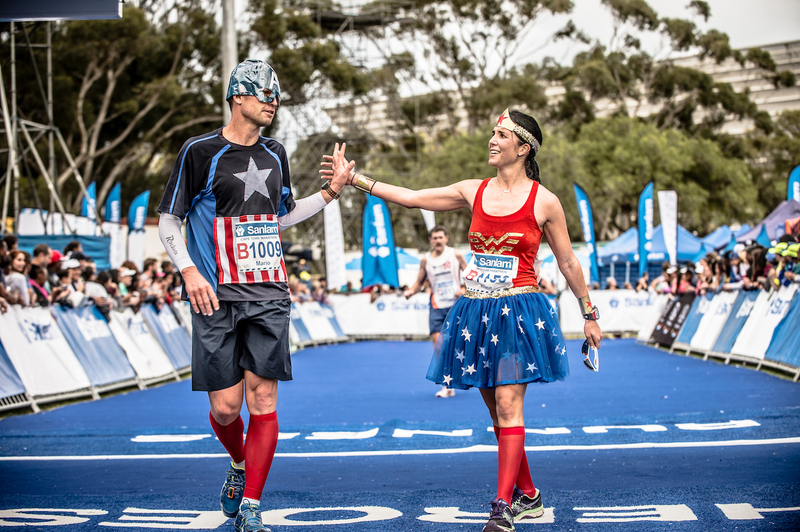 There’ll be runners dressed as their favourite comic-book superheroes, running for distance running and endurance sports academy Endurocad this year, with the NPO providing live community music band entertainment at its 32km supporters’ zone mark. And runners and spectators won’t be able to miss the action at Jag Foundation’s supporter zone area, where they will be counting and celebrating 400 runners passing their mark – it would have taken runners 32 000 steps to get there, which is the same number of kids the foundation has engaged with in dealing with communities affected by gangsterism, drugs and abuse. As a sweetner for this year’s colourful marathon, title sponsor of the event Sanlam, will be handing out generous spot cash prizes to supporters who come fancy-dressed to support their family, friends and neighbours. Sanlam will be giving away R150 000 worth of cash to those who bring the most gees to the route. 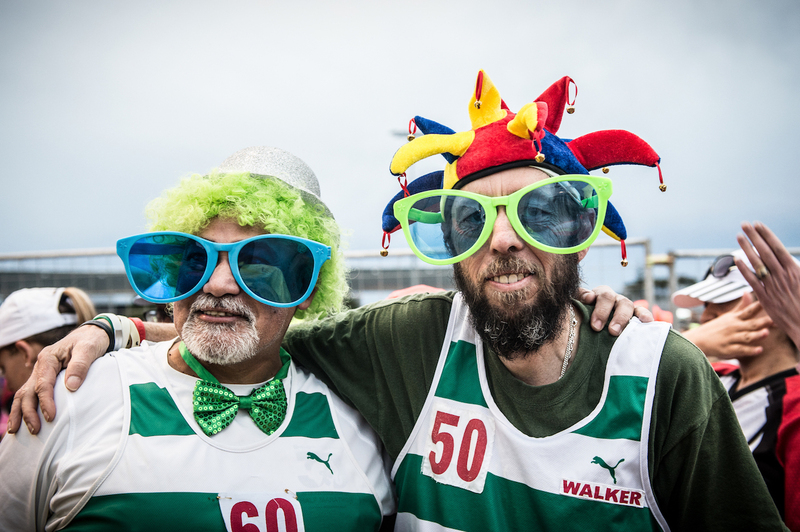 Dressed-up spectators should keep an eye out for “Gees Squads” who will be moving through the various spectator zones and handing out spot prizes of R1 000 each in the form of “crack-back” cards to supporters who they think are showing the runners the most gees. There are also three grand “gees” prizes up for grabs. To make yourself eligible, get a group of friends or family together, dress up and create a dance. Video or photograph yourselves, then share it via social media, tagging #SCTMgee and @ctmarathon. A team of judges, who will also be recording what’s taking place at each spectator zone, will judge all the entries at the end of marathon weekend. First prize is R50 000, second prize is R30 000 and third prize is R20 000. Africa is my home; this is my race. It’s Cape Town, must run it!